This round was against the Mounted Chain Breakers, and Big Boned Billy’s Revenge were attempting to take the Mine Workings from them. Chris wrote an excellent account of the battle on the Facebook Group page, but if you didn’t have time for that… I lost. With downtime out of the way, it was time for the next round! I was matched against Matt’s Genestealer Cult gang ‘The Rusted Maw’ and they were attacking my Old Ruins territory. We rolled up the Marauders scenario, and the cult’s special mission was Mayhem (take my gang out of action then leave the board). I stayed back until I had some reinforcements and then started surrounding the horrible monsters. The Rusted Maw had really, really rotten luck. After having their drinks spiked at the local Delaque Drinking Hole, they were unable to hit much and when they did failed to wound. They ran out of ammo and couldn’t reload. The only good luck that they had was when Shake’s heavy flamer missed by a millimetre and failed to do anything more than give a light tan to a cult ganger. By the end of the game, 5 cultists had been taken out of action and only one had exited the board, having completed their mission. Three of the kills were credited to Gramps – Gramps was one of my downtime purchases, a Champion with a shotgun from the old lead Delaque box. Well now I have to clean the old basecoat off and get around to painting him properly, if he’s going to perform that well in the future! Big Boned Billy’s Revenge fought against the Feminasties, an Escher gang, in their third scheduled game of the campaign. Unfortunately I’m writing this some time after the battle, so details will be sketchy. Oliver had a much better position and flanked the Revenge – who were mostly stuck behind a single barricade across a wide open space! In general, the Revenge held their own in close combat but after one rotten turn of recovery rolls took out a number of them it pivoted from ‘we can still do this’ to ‘where has everyone gone?’ Billy and Penny were the only fighters left and bottled out knowing that they were probably the only fighters out of recovery. Oliver won the Sludge Sea territory from this straight-up Tunnel Fight. The wrap-up was a mixed bag. 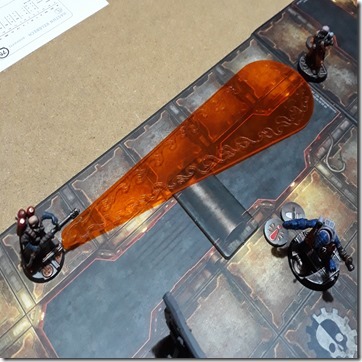 There were actually three fighters available for another game, but the ganger taken to the Rogue Docs for an extortionate 100creds ended up dying anyway, of complications! Such is life (and the end of it) in the Underhive. I needn’t have worried so much about recovery; the past week has been ‘Downtime’ where all fighters come out of recovery and get a bunch of credits to spend. The house masters have also given Billy’s Revenge some extra credits to keep him going for the second phase of the campaign! Looking ahead, in the next campaign I will not be buying a heavy weapon again. They’re too expensive, and I would do better with more well-equipped fighters. I’ve heard that Forge World will be doing a Delaque weapons set soon so I will have a lot more options for the gang. The only thing that a heavy flamer has been good for so far is terrorising enemy gangers. If I do pick a heavy weapon, something more dangerous will be on the list… I will also probably skip the Long Rifle. It’s of limited utility in the Zone Mortalis games, although I love the model. The campaign allows for two games each round – your fixed game, and another optional one. This way a player can’t race ahead just for having loads of spare time while also giving a little boost to those gangs that need it. Having only three fighters able to take part after the last game, Al (our Arbitrator) offered to play me at a Shoot-Out since that would get a lot of my gang out of recovery in time for the next round. Shoot-out works much the same as it did in old Necromunda, but integrated with all the reputation rules, etc. Big Boned Billy’s Revenge now sits at 10 reputation having risen after every game – never falling back. The Revenge had Billy and Shake (the heavy-flamer Champion), pacing towards the Goliath and his mercenary friend. The Delaques kept their cool, but Shake was unable to get a shot with his flamer before he was taken out of action in combat – taking a Spinal Injury and missing the next game. Now most of the gang is out of recovery, I’ll be looking for ways to make some credits and build back up to strength. Some of the fighters are starting to gain advances too – Dot Junior (the Juve) is training for a future in close combat. My second game was against the Escher gang, the Toxtown Terrors. We were playing for the Needle Ways in a Tunnel Fight, and it looked promising for Big Boned Billy’s Revenge as they went up against the already bloodied and bruised Terrors. The Revenge started out sneaky, spiking the drinks of two-thirds of the gang, leaving only the Juves alone. This contributed to the rather slow start – neither gang being able to land a hit and (on the rare occasions that they did) failing to wound. Eventually stray shots started to hurt, as Shake (the Revenge’s Champion Arsonist with a heavy flamer) got hit in the back by a teammate and after too many rounds of no action, suddenly damage started flying on both sides. The Revenge got complacent though, and didn’t realise that the Terrors had already won the scenario… they stuck in until the tunnels were empty and only then counted the cost. Three fighters were critically injured, and only Penny could afford to see the Docs. Jacob and Wilson died of their injuries later. Arnold and Irving took Grievous Injuries, while Lawrence was humiliated (-1 Leadership and Cool). Only Dot Junior, Shake and Billy himself were fit and healthy after the game. Dot Junior managed to take a champion out of action, and scored extra experience from Billy’s Mentor ability – now he has enough for some advancements, I think I’ll improve his Weapon Skill in order to groom him towards close combat prowess. I think I’m going to try and squeeze in a bonus game this round, to try and keep it easy and get some of the fighters out of recovery before the next round! The new Necromunda is fantastic, and I’ve been getting back into painting my old Delaque gang with some additions from the Heresy Miniatures ‘sci-fi trenchcoat gang’. They look a lot like extras from the Blade films, especially with the bat shaped belt-buckles. Like a very off-brand Dark Knight. Al Weeks has set up a Dominion campaign in Bristol and since I like campaigns and want to play more, it seemed like a great idea to get into it and get some use out of that Necromunda box! Since I couldn’t find my old gang list to update and convert to the new rules (damn thing has been around nearly 20 years and now it goes missing?) I started from scratch with the idea that Big Boned Billy (the heavy of the original gang) has struck out on his own. He lost his heavy stubber (not available in the new list) at some point, and I figure that is why he’s so mad and has called the gang ‘Big Boned Billy’s Revenge’. A couple of old characters came along too – Shake, who used to be a juve and is now a champion with a heavy flamer and Dot Junior, a new juve presumably some relative of Dot (a juve-turned-ganger in the original gang). The Revenge’s first game was a Bushwhack against the Midnight Hand (another Delaque gang) in the tunnels beneath a Drinking Hole. I’d just observed the Midnight Hand getting mashed by Matt’s Genecults (despite the lights being out, playing to the Hand’s advantage) and they were still licking their wounds when the Revenge came upon them. Shake snuck around the back and toasted their leader who succumbed to the flames later – but not before taking out Lawrence (a ganger who thought he could take the burning Delaque). Billy and Dot Junior ganged up on a champion, gaining Dot some valuable experience. Billy took a bunch of flesh wounds and almost went out of action, but stayed in and recklessly engaged another ganger. Billy had three attempts to use his Mentor ability and flubbed all of them. Billy needs to work on his communication. The gang bottled out even though the only Hand fighter left was engaged by three of the Revenge, but it counted as a victory because of the number of enemy fighters taken out in the Bushwhack. In the aftermath, none of my injured fighters had any lasting injuries but some of the Hand went into recovery. With the profits of the skirmish the gang bought stiletto knives for several members (who felt under-equipped when the melee begun) and I’m looking at saving up for a new juve. I didn’t have time for a second game in this round but hopefully I’ll have time to squeeze one in next time. It’s definitely fired me up to get the rest of my models painted, and I’m working on some scenery from a Mantic Ruined City set.